According to Wikipedia, Airstream is a brand of luxury recreational vehicle manufactured in Jackson Center, Ohio. The oldest company in the industry, Airstream trailers are easily recognized for their distinctive rounded aluminum bodies, which originated in the 1930s from designs created by Hawley Bowlus. To me, what's most interesting about Airstreams is the current trend of gutting them & creating boutiques on wheels. While researching this trend, I came across an article on TrendHunter Business featuring Los Angeles-based independent designer, Jeanne Landau, who has gone mobile in her Airstream aptly named Hitch Couture (interior photo above). The Urban Cottage Airstream (left) is a new Dallas-based mobile furniture showroom steered by Ida Gleaton. The traveling boutique carries an ever-changing mix of furniture Gleaton has refurbished. Another shiny silver Airstream is home to Grey Dog, a vintage boutique in Fayetteville, Arkansas. Following owner Molly Clark's lead, there are now three other Airstream shops in the area - Wheels Grill, Silver Stream Café, and Out on a Whim - with an occasional fifth joining them. The allure of a shop on wheels seems to be mobility & low overhead costs. Brick & mortar locations can be very costly & good locations can be hard to come by. Of course, many are drawn to the quirkiness & originality that can be found in a remodeled Airstream. As you can see, this trend is one that seems to be quickly spreading throughout the United States which in turn may drive up the cost of Airstreams. 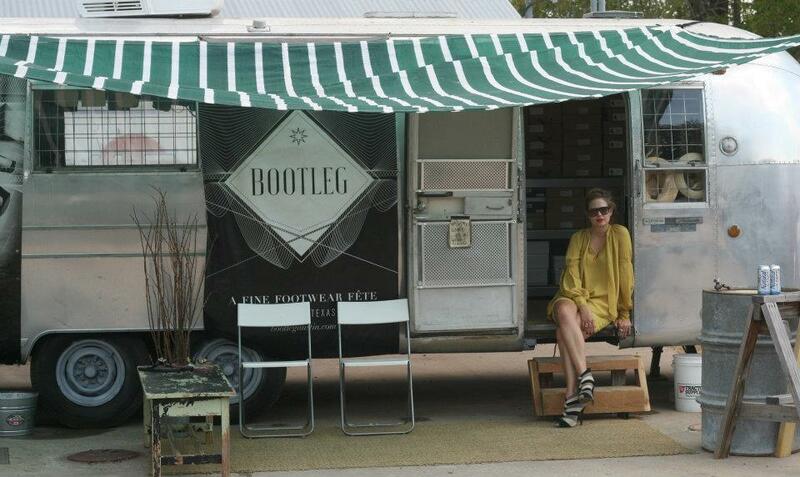 Other Airstream boutiques I discovered online include Bootleg Shoe Boutique in Austin (pictured), Southern Hippie in Georgetown, Haberdash Vintage in Boston, and tech-savvy sportswear label AETHER who's set up in San Francisco's mobile-focused shopping lot Proxy. what a great idea! I am inspired. Love it!!! come to Houston!!! it was kind of you to spend some time sharing this informative information with us. keep posting and make this page more effective.